I just love this sweet and adorable flower. It's so cute and versatile. Trust me you're going to be addicted to making these flowers really soon. Especially if you like covered buttons. 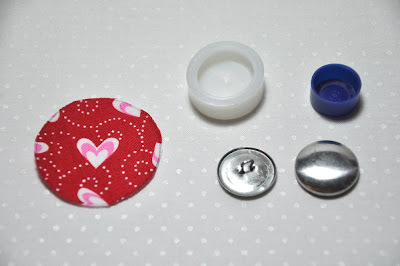 I know there are quite a few of you out there that LOVE covered buttons so you can just add these to your list of things that you absolutely LOVE. You can thank me for your newest obsession later, Okay? 7 Squares of fabric measuring 3 1/2" x 3 1/2"
1. Cut and starch your 3 1/2" x 3 1/2" squares. 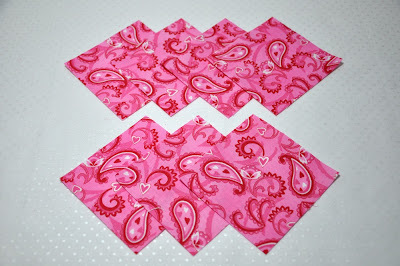 The size you cut your squares will determine how big your flower will be but for this tutorial I will use a 3 1/2" square. 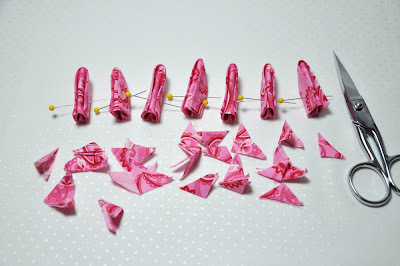 You can also make your flower with 5, 6, 7, 8 or even more petals but, for this tutorial I will be using 7 petals. 2. Fold the bottom corner up to meet the opposite corner. 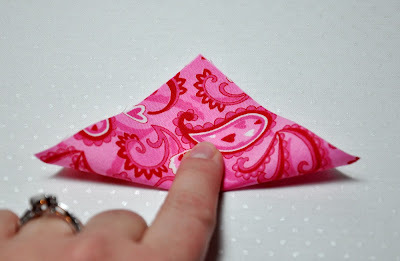 Make sure that the wrong sides are folded to the inside so that the right sides will appear on the outside. 3. Now bring the left outside corner and the right outside corner up to meet the top corner as seen below. 4. 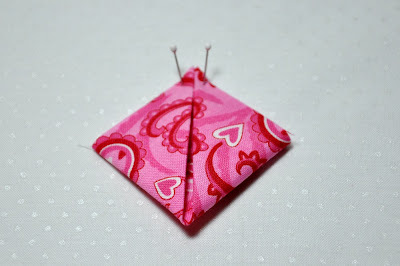 Flip the fabric over and fold the outside corners into the center as seen in the picture below. 5. Fold in half making sure the folded points you just folded in the previous step are now on the inside. 6. Push a pin through the middle making sure to catch the folded points in the middle as seen in the picture above and below. 7. Repeat this process for the six remaining squares of fabric. 8. Line up the 7 Kanzashi petals. 9. Trim off the triangles at the end of each petal (raw edges) as seen in picture below. 10. 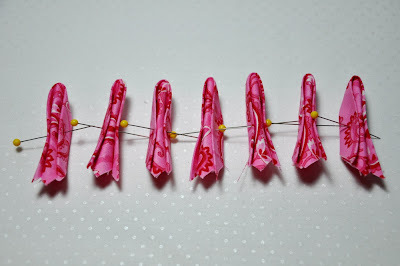 String all of the Kanzashi petals on a needle with thread that has been doubled and knotted at the end. 11. 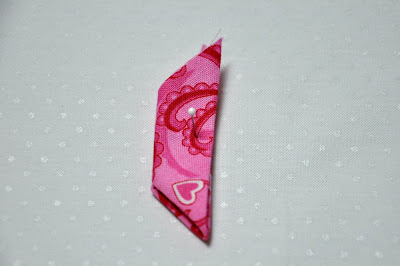 Here is a front or top view of what the Kanzashi petals look like threaded together. 12. 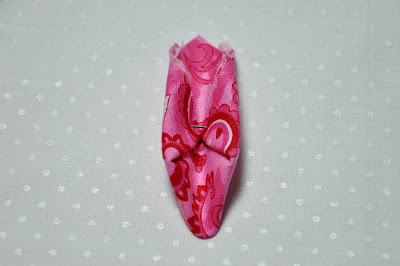 Here is an underside or bottom view of the Kanzashi petal. Click picture to have a closer look. 13. 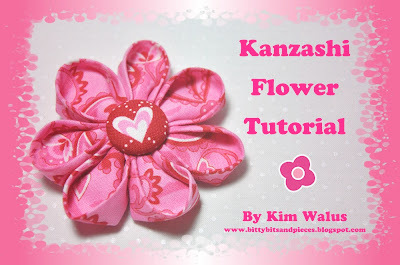 To finish off your Kanzashi Flower you will sew the petals to each other on the underside of the flower. 14. 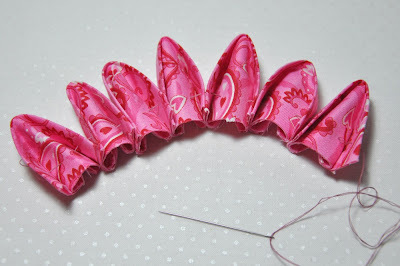 Now sew the petals together on the top side too. 15. With your iron, give the Kanzashi petals a blast of steam. 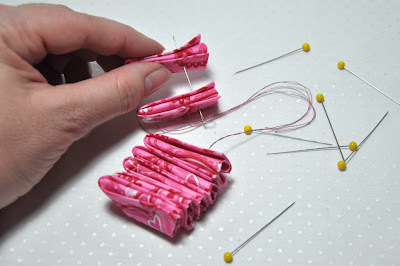 This will soften the starchiness of the fabric and allow you to play with the petals until you have them just how you want them. 16. 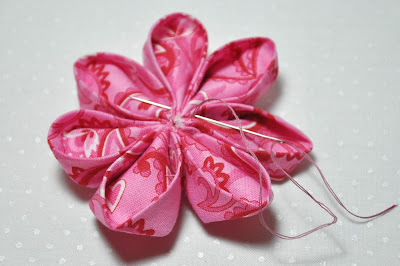 Lastly, you will make a covered button for the center of the flower. Just follow the directions on the covered button package. I used a 7/8" covered button. 17. Here's the finished flower. 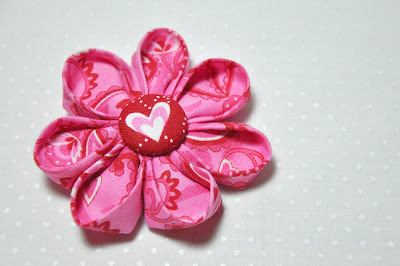 You can add these adorable flowers to just about any sewing or craft project you could think of. That is so cute! Thanks for the tutorial! Fantastic tutorial, Kim! And you did the flower in my favorite color, PINK! Such a wonderful flower!!! I love it very much.I will try to do it immediately... I wrote you a comment in your post from Jan.18th....I hope that I am allowed to show my German blogfriends, which great lady and her lovely blog I have found in the USA!! I'll take just one little pink one please. :0) These are so sweet!! Cute for a lapel pin!! Thanks for the great tutorial! It's beautifl! 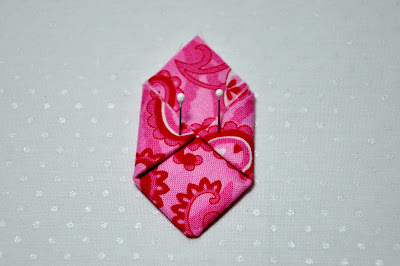 I love kanzashi--it is so satisfying and much easier than the finished product looks. what a cute flower - thanks for the tutorial. Thanks for the great tutorial! You are correct, these are totally addictive. Gosh that is cute! Thank you!! Thank you Kim! I'm going to have to try this. Thanks! I love these little flowers. I think I'll have to try one. Hello!! Is very interesting your blog!!! I have a question, where y can buy the machine to covered the buttons??? Here in Argentina don´t exist... Sorry but my english is very bad!!! Ah! The flower us very beaurifull!! Love it going to try it. Thank you for the tutorial. Gorgeous flowers. I just love covered buttons too! This is so stinkin' cute. I'm going to have to try it! Thanks, Kim. Thanks for the tutorial Kim -- those are adorable! Delightful flower. Excellent tutorial. You definitely go into my list of favorite tutorials. I can't wait to give your tutorial a try. Love your fabric flowers! Those are simply wonderful, thank you for the tutorial! Kim, this is so adorable! I've always wondered how to make those. Thanks!! Ok, I don't sew, but I MIGHT be able to complete this project. (Don't laugh!) I think I might actually try this. I'm kinda excited! I'm off to the store to buy some fabric. Kim, if I can actually do this simple project, I can maybe - and that's a huge maybe - try some kind of TINY quilt project. What do you think? You have such a wonderful tutorial that make it look very easy. Thanks Kim!! I made one. Not QUITE as cute as yours though! 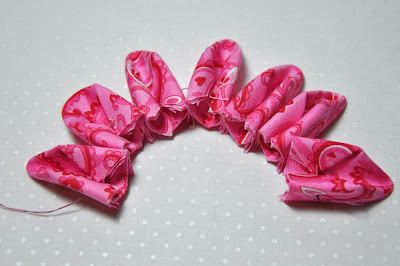 Those are so cute, I think I will use this to make some for hairclips for my daughter! Thanks! oh my..that is a gorgeous fabric flower Kim. Thankyou for sharing with us. As soon as I saw your tutorial I knew I had to make one and I did and it turned out great. Thanks so much Kim!! Yummy pink flower made into a beautiful flower just in time for Valentine's Day! Awesome! I AM one of those people who are crazy for covered buttons! I WILL be making these. Thanks so much for the directions! You make this seem so simple! thanks! Thankyou Kim for this lovely tutorial! Thanks for sharing this. I just learned to make these in my sewing group this month, but my end result was floppy and fell apart. 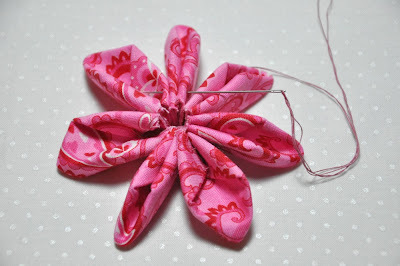 I can see from your very well explained and well photographed tutorial that I need to starch the fabric and thread the petals together higher up so I am catching the folded corners. Thank you - I was so excited to learn how to make these, but then so disappointed when it didn't turn out right, and now I am excited again! Love your blog - thanks for taking the time to make such a great tutorial. Well, how fun is that!! Thank you!! This is so cute and so well explained. May have to try making some! I have become a follower of your blog and invite you to do the same! AWESOME Tutorial! I will be making some of these to put on my niece's summer outfits for sure! nice ideas and tutorial. thanks. Thank you so much. This was easy to follow. I just saw this at a Japanese store near by and loved it, but could not make sense of it no matter how much I stared at the project. They had them string together over some children clothing. They also had them on bags, lunch bags, hair bands, and some cute baby quilts. I love it! 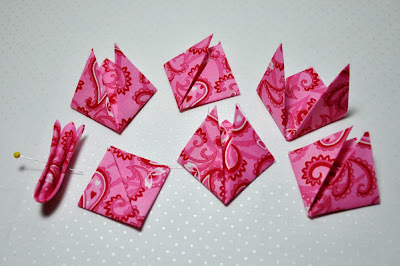 these are so wonderful and i am gonna make a bunch as soon as i can! I like how you've done this with all sewing (no glue). I have just learned how to make these using the instructions in the book "Kanzashi in bloom" (I've made a grand total of 3 so far!) and it is the same up until the point where you sew the petals together front & back. I think I like your method better... will try it your way with the next one! Thank you for the tutorial. Very well explained and easy to follow. This is a picture of the sunflower I made. Very nice. Ich like it.